We remained on-board for the remainder of the cruise. 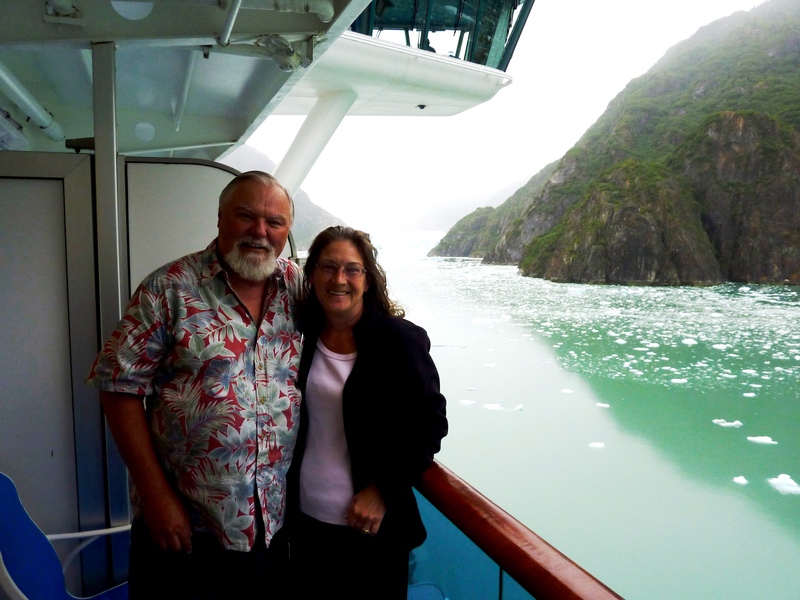 Our last day in Alaska was a cruise up the Tracy Arm Fjord to the Sawyer Island Glacier. 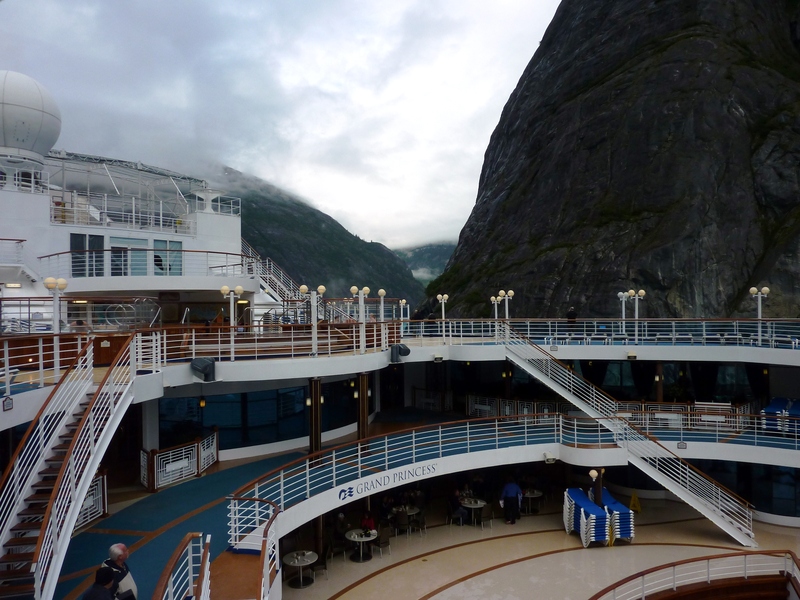 We spent a few hours at the glacier and then begin the two and a half day cruise back to San Francisco. I have to tell you about my biggest complaint about the ship, Internet. They charge almost two-hundred dollars for ten hours of service. That is why there was no blog posting during the ten-day trip. Believe it or not, the cruise line charges the crew the same amount. I was up at 5:30 a.m. We approached the glacier as I got topside. It was biting cold. The bay was clear of any other vessels. I took these at 5:50 a.m. as we slowly neared the glacier. 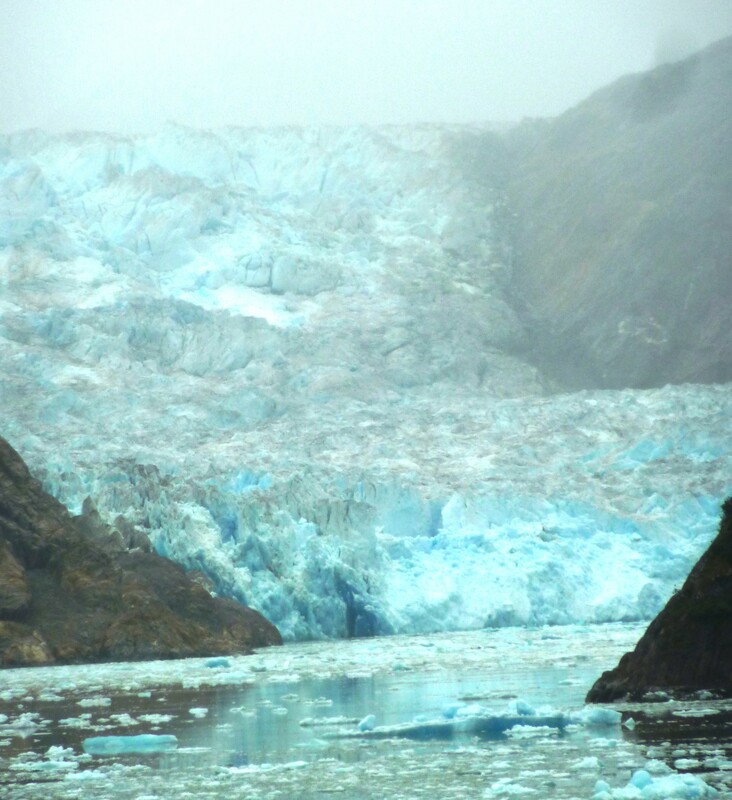 Crew members told us that sometimes the fog is so heavy that they can’t get close enough to see the glacier. 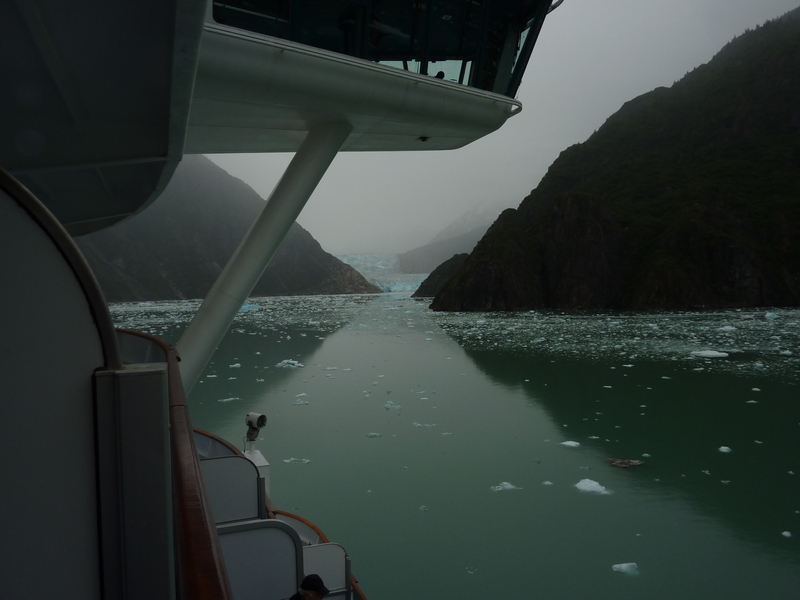 The ship rotated so that every passenger and stateroom had sufficient time to watch and photograph the glacier. We had breakfast at the Horizon Buffet with a window seat. Enjoying breakfast, I forgot just how cold it was outside. We had a room service order for coffee at 6:00 a.m. The waiter was new to the crew and had never seen a glacier. Cathy invited him in. He was in awe of it. We got him to snap this photo of us with the glacier in the back ground. I prepared well for the weather, shorts and my ever-present Aloha shirt. After we went topside, I remembered just how cold it was. We saw movement from the glacier. We watched a huge slab of ice break away. The splash was followed by a tremendous roar. We heard a motorboat and then this zodiac boat came into view. It was a five member film crew. 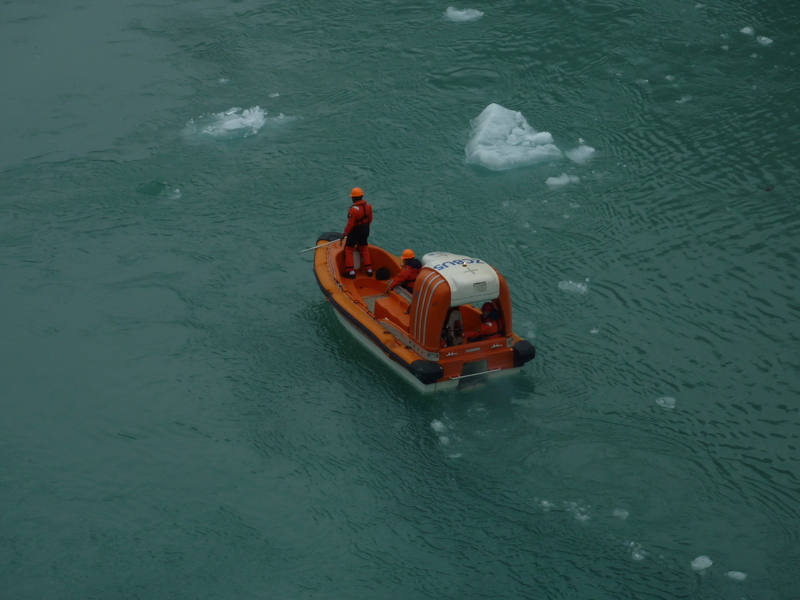 The man standing in the bow looks for ice. If spots a large piece he warns the boat operator, if small he has a long pole to push it away. They moved very slowly. 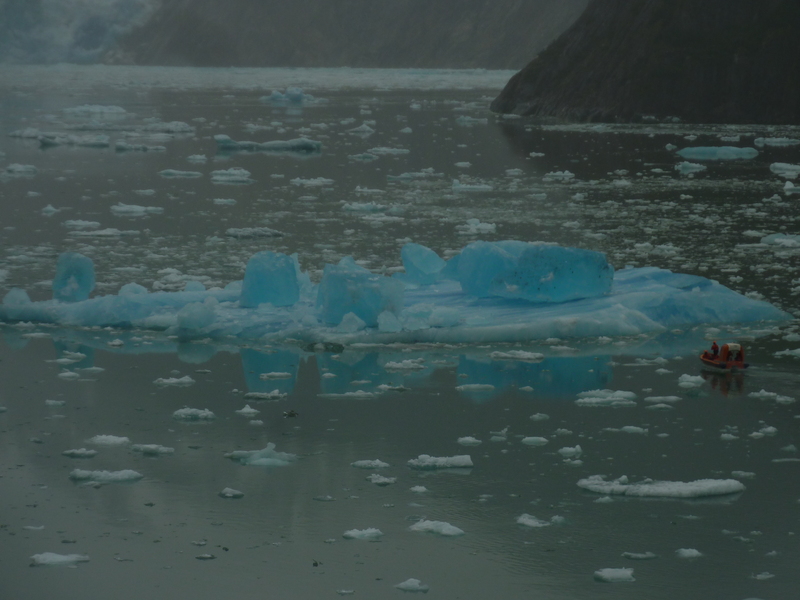 This iceberg was one hundred yards or so from the ship. With the zodiac at the right side you get an idea of how large it is. Visiting Glacier Bay a dozen years ago, several cruise ships moved about. The Tracy Arm Fjord is much smaller. When the Grand Princess was rotating, there wasn’t much more than a hundred yards from either end to shore. Traversing the fjord out to the open sea, there were places where two ships could not have shared the passage. The trip back out to the open sea remained cold, biting cold with snow-capped mountains on both side of the fjord. The mountain is about fifty yards from the right side of the ship. There isn’t much more room on the left. We turned and passed through the notch visible in the center of this picture. This was a successful cruise. We enjoyed ourselves; saw some good shows and sights. 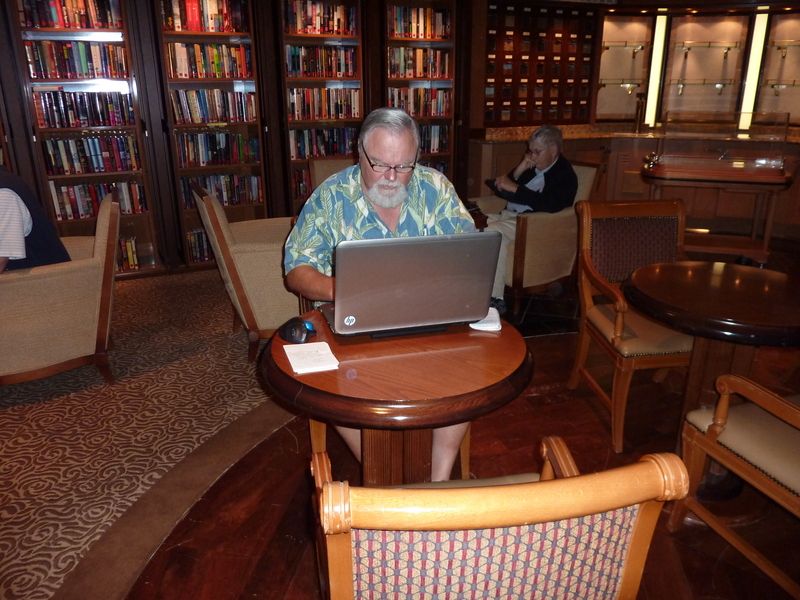 I’m happy to report that during the cruise, I wrote over 15,000 words. Of those almost eleven thousand were for the new novel. Great photo of you and Cathu on the Deck…..Thank you for sharing this!…. Hi George…i was on the same cruise several years ago. Thanks for the blogs.